On the left is the gambling / banking minigame. Spend your spare ¢oins on six stocks, then pull the handle to watch your investments go up or down. But pay attention to the headlines, or you might invest at the wrong time! On the right there is the Hallucinatory Battle Arena. Enter the cave and defeat 11 waves of enemies to win an exclusive prize! Eight side-quests have been added to the game. Some build upon content that has been in the game a long time, and others involve new content. Pictured above, we have one portion of a trading sequence (left), and a short stealth mission (right). Most of the work in this update has gone into building new systems to support better boss battles (multi-part sprites, behavior trees, beams, etc.). Pictured above is Crabaddon, the first of the new bosses, designed largely by Jay. 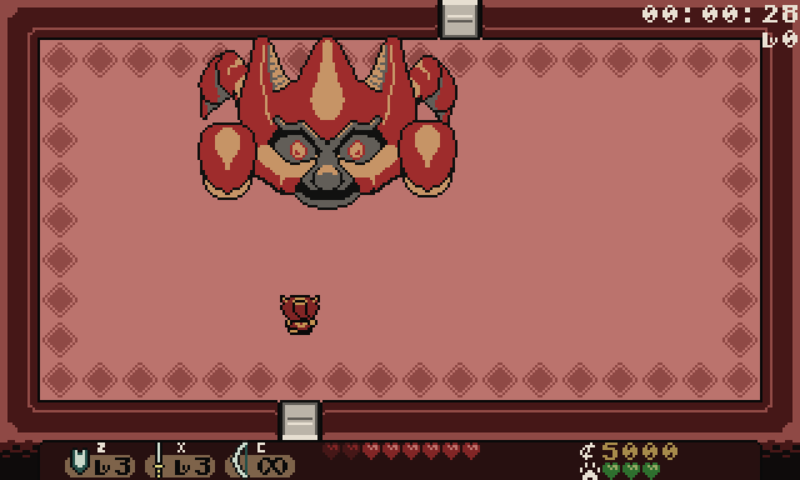 Crabaddon will replace one of the old bosses in the randomly-generated dungeons. Since you can get these bosses in any order, these new bosses will all have two phases. You’ll always fight the first phase… But you will only fight the second phase if you’re in one of the late-game dungeons. If you bought the game through itch.io, you can preview this update through the “unstable” channel in the itch client!